July 20, 2015 Erika finds an injured seabird on a Florida beach. Summer is a busy time for beaches. I have just moved to Florida for a new post-graduate job, and on my very first night I jumped out of the car and sunk my feet into the sand on Okaloosa Island, part of Florida’s panhandle. A wildlife encounter quickly reminded me that we share our coastline with many other creatures, and that we have a responsibility to them. The sun was rapidly descending, casting a golden light on the white-sand beaches and against the raised dunes. My husband and I walked slowly by the water, watching Least Terns forage in the shallows and Snowy Plovers run along the waves. As we passed a rock jetty, we noticed a dark shape on the sand, sitting stone still. 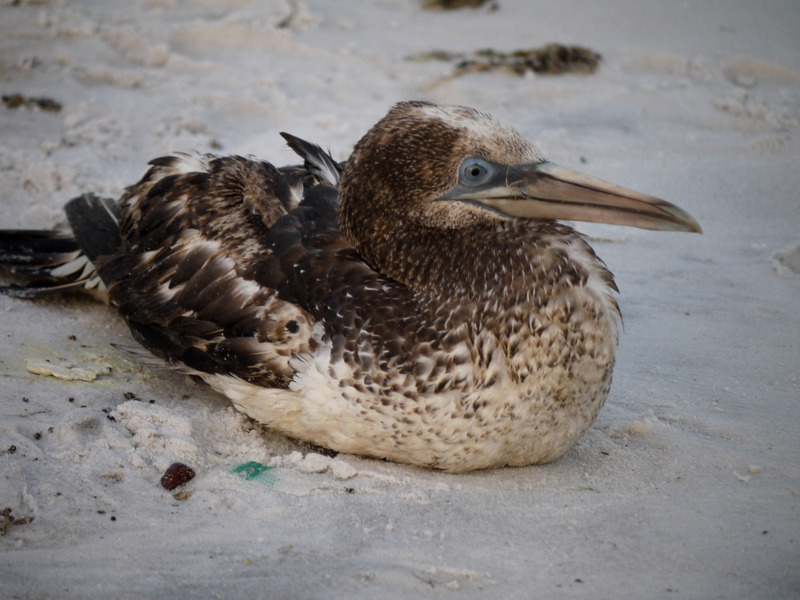 As we approached, I thought it was a seabird, first misidentifying it as a Brown Booby before realizing it was a Northern Gannet (okay, I didn’t realize it was a Northern Gannet until the next day – birding fail!). Now, you’re not really supposed to see Northern Gannets sitting on the sand in the middle of summer. They are birds of the ocean, gliding along the winds and fishing from the surface. 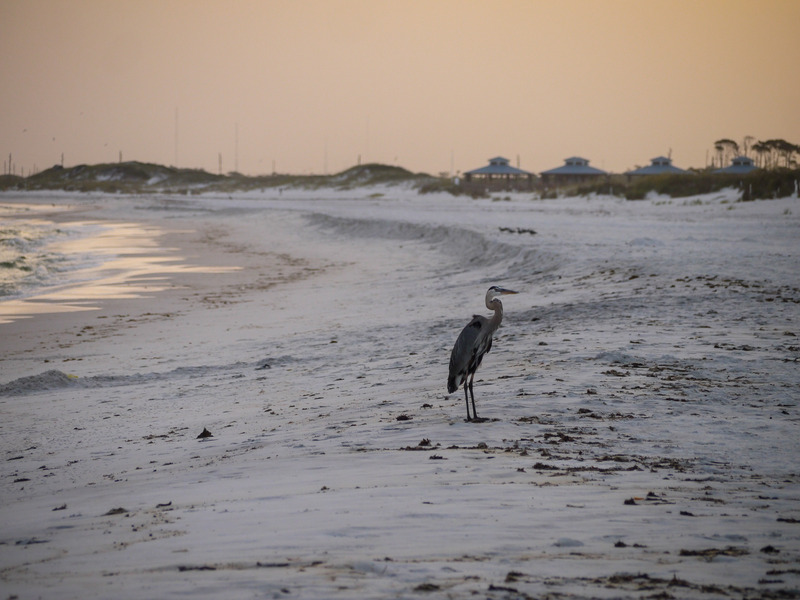 Their populations migrate north in the warmer months to the northeast, only returning to Florida in the winter. There was another problem. This gannet was clearly conscious, turning its head back and forth, but it wasn’t moving from its sitting position, not even when we approached within a few feet. No wild bird will allow a human that close unless it is injured or very habituated to people (think pigeons). Something was wrong. The question was, what to do about it? It was after normal business hours, heading into the 4th of July holiday weekend. I quickly googled nearby wildlife agencies and rehabilitators, but when I called I either heard answering machines or contacted rehabilitators that didn’t take birds. I eventually left a message with a local refuge, and regretfully walked away. As I was staying in a hotel before the job began, I couldn’t even bring it with me in a cardboard box, as one site recommended. And then, human kindness shined. On the way back to the car I ran into a fellow with nice camera equipment. Taking a shot, I asked if he was a birder. “Somewhat,” he replied, but that was good enough for me! 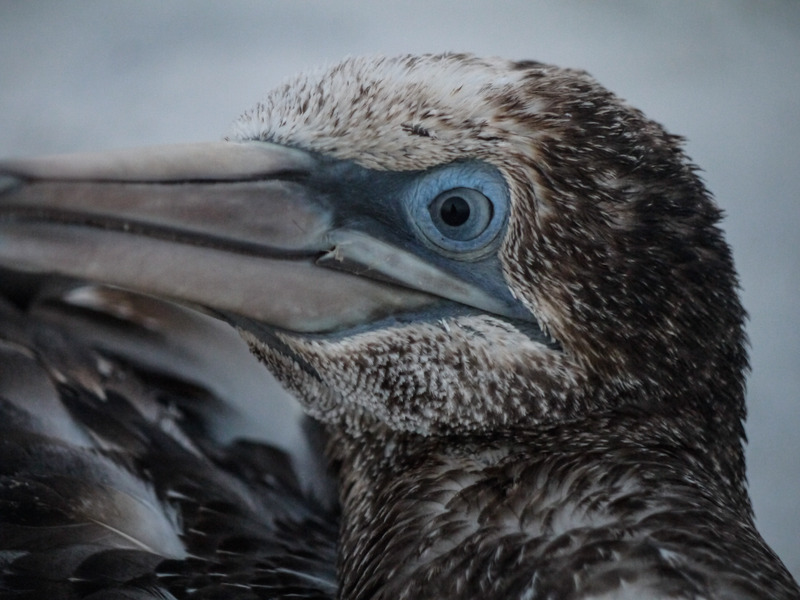 I launched into an explanation about the gannet, asking him what he thought we should do. I couldn’t believe my ears, but after I described the situation he told me how he was familiar with the refuge and lived nearby, so he would take the gannet home until the refuge opened in the morning. He did just that, carefully wrapping up the large bird in a towel and taking him back to his car (If you need to take a bird home, be very careful with the bill and follow these instructions). He went above and beyond to try to rescue the bird, and he definitely strengthened my faith in humanity. Unfortunately, this story doesn’t have a classic happy ending. 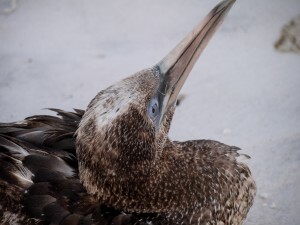 The gannet was severely malnourished and weak, and didn’t make it. Perhaps it was ill and couldn’t find food, perhaps it had accidentally swallowed something; we’ll never know. I was sad when I heard the news, but grateful that the man and the refuge had done all they could. So though this blog may not have a rosy ending, it does have a moral. Someone I never met went out of his way to save a bird, and I truly admire him for it! If you see an injured bird, don’t feel like there’s nothing you can do, you can! Call a wildlife official or google a rehabilitator, and don’t give up if you reach a few answering machines. Click here for a list of steps to take when rescuing an injured bird. Good luck! Note: Though someone handled an injured bird in this story, touching the bird yourself should be a last resort. If you must touch a bird, wear gloves.